The laboratory for which I work has close ties with our facilities in Italy, and people from my office are constantly traveling there for business. I haven’t gotten this opportunity yet, but at least when people from my department go to Italy, they often bring back sweets for my blog. 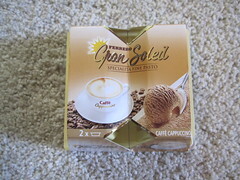 Gran Soleil is an interesting, ice cream-like treat my boss found in the check-out lane at an Italian supermarket. It comes in other flavors, but this one is Coffee Cappuccino. My boss doesn’t speak much Italian (nor do I), so neither of us knew what it was, but we gathered that it had to be frozen. My stepmother-in-law, who speaks some Italian (thanks to several lengthy assignments there), was able to gather from the instructions that I needed to freeze the package overnight. It was a snacking experience unlike any I’ve had. Before freezing, the Gran Soleil sounded like gel when I shook it. It solidified after freezing, and since there were two packets, my husband and I each had one. 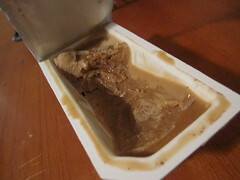 The frozen paste didn’t really look like the picture, but it was still somewhat ice cream-like. It was quite sticky and had an intense coffee scent. Gran Soleil must have contained a fair amount of water, because there were plenty of ice crystals. True to its scent, the coffee flavor was strong. This was a good thing, though, because the mixture was syrupy and sweet, even a little cloying. Still, the experience of freezing the package myself was fun and new. I think I’d like to try other flavors, though.